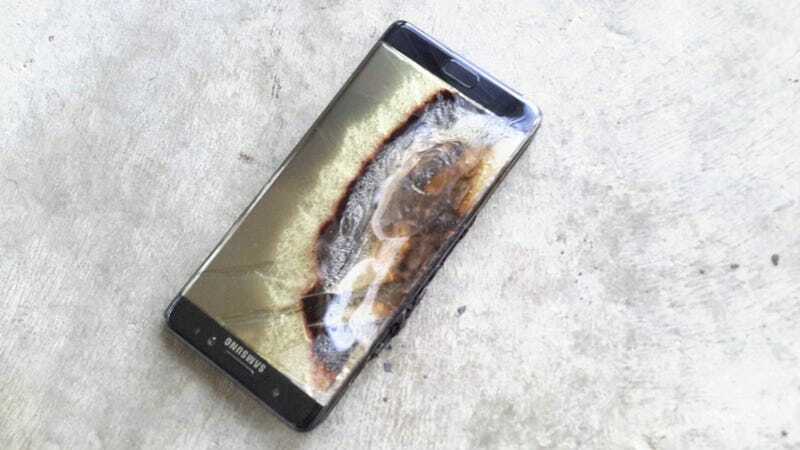 Samsung’s exchange program for Galaxy Note 7 has been a nightmare for customers so far. A week after Samsung’s “voluntary” recall of the Galaxy Note 7, customers have yet to be clearly told when and how they’ll be able to replace their devices—devices that could set cars, hotel rooms, or garages on fire—with new, working models. Samsung last week said customers would be able to exchange their phones for a refund or a new device but customers don’t have a clear idea on who to contact or when replacement devices might be available. Samsung USA has not replied to a request for comment from Gizmodo. The US Consumer Product Safety Commission (CSPC) has now officially weighed in, urging all Galaxy Note 7 owners to power down their devices and not use them. CSPC says it is working with Samsung to announce a formal recall soon, which would result in clearer guidelines for consumers. The process is proving to be a shitshow both for those who bought the device through carriers, and for those who purchased directly from Samsung. Wireless carries including, AT&T, T-Mobile, and Verizon all confirmed to Gizmodo that they have not received replacement devices from Samsung. A tipster who asked we just call him Matty sent us an email about his frustrating experience trying to get a Galaxy Note 7 replaced from Verizon. First, he called Samsung and attempted to set-up a return. Samsung told him he had to go to his local Verizon store and do the exchange with them. So I trot over to the Verizon store where I purchased it, and tell them I’d like to exchange it for another Note 7. 30 minutes later after a nice wait, a representative comes on over and helpfully says I can either exchange it for another model, or return it completely. When I say I would like to exchange it for another Note 7, the look of confusion on his face hit pretty hard and fast. A quick scurry to the back to talk to his management and it’s decided that they have no information from Samsung on how to do that, and that in order to exchange the phone I’ll need to contact Samsung. Since he already knew calling Samsung would be pointless, Matty then decided to call Verizon’s customer service line. The operator on the line was also clueless. I talked to a Verizon spokeswoman who confirmed that Verizon does not have replacement units for its customers. Instead, users can either opt to return their phone or exchange it for another model. And frustratingly, Verizon also doesn’t have any information on when they will have replacement devices. The Verizon spokeswoman did tell me that when it does gets new stock from Samsung, it will be supply constrained. Verizon’s initial shipment won’t be able to cover every Note 7 it has sold, at least, not at first. The situation isn’t any better for customers at other carriers. T-Mobile and AT&T don’t have fresh inventory from Samsung either, which means customers can either wait around with a phone that might spontaneously explode or get something else. I was informed by the Samsung representative that my options were to send the phones back then re-purchase them after my account credited, or to buy 2 new phones ($1800 out of pocket) and return the originals and wait for a credit. Since the error is theirs I don’t see why I should have to put out any additional money upfront. Why doesn’t this work like a normal exchange where they send you the new product and you have 14 days to return the old one or else they will charge you? When she reached out to her carrier, T-Mobile, she was told she could return her phone to a T-Mobile store in lieu of sending it back to Samsung. Unfortunately, the company doesn’t expect to have large quantities of Galaxy Note 7 devices until October or November. It’s understandable that Samsung doesn’t have replacement devices yet; it takes time to mass-produce phones with fixed battery components and ship them around the world. The problem is that customers—and carriers—are being left in the dark. Samsung Australia said today that it will have replacements available on Sept. 21 but Samsung USA is silent. As we’ve pointed out in previous Gizmodo stories, Samsung initially didn’t go through the traditional channels for this sort of recall. Because this is a “voluntary” recall rather than something coordinated with the CPSC, the entire process of both getting phones returned and getting new models exchanged has been more opaque than it should be.